Want the fishing pole to stay? All personalization info for the bottom of the stone can be placed here in this box. Also, mention if you'd like the fishing pole to stay or be removed. 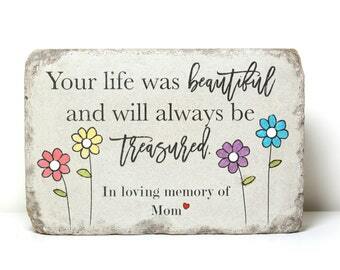 A simple yet beautiful memorial stone for indoor or outdoor. Sturdy, 6x9 rustic tumbled concrete stone that is fully sealed for indoors or out. Personalized with the name/date you need, it will be a treasured keepsake for years to come. This stone is extremely classy and is something you won't find anywhere else. In life we loved you dearly, in death we love you still. In our hearts you hold a place no one else will ever fill. The name and date can be personalized however you like. Tiny fishing pole can stay or be removed. It was a special request with the initial design. Mention in the notes if you'd like that to stay or be removed. Leave all personalization info in the box provided. ~MADE in 2-5 business days. Need it ASAP? Choose RUSH PRODUCTION for 1-2 business days. ~SENDING AS A GIFT?.....Invoice is NOT sent with package, so make sure you include a message for the card (in the "notes" at checkout) so they know who the sender is. Also make sure you have the correct address chosen. *NEW* UPDATED OPTION: I can add a bottom line of text with NAME and/or DATE (no extra charge). Leave all info for personalization in the "notes to blessingandlight" at checkout. All stones ship with a wide kraft paper band and are ready to gift. This upgraded option adds a pretty red satin ribbon bow, perfect for the holidays. It’s beautiful- stone is very heavy, inscription was perfect, looks just as it’s pictured, shipped quickly and came in a sturdy box. The family loved it, they were truly touched to receive it. My friend’s father passed away suddenly, he was a great man, a great family man, and loved nothing more than having the whole family in the yard for a party. I wanted to give them something more than flowers and a sympathy card, this was perfect, they’ll keep it in the yard that he loved so much. This item was exactly what I had hoped it would be!! The recipient of this gift was overcome with tears of joy for her loss! Now she has a keepsake for the memory of her loved one! Wonderful quality! Thank you! Great magnets & packaged beautifully! Prompt service! Very pleased! The stone was just as described and as ordered. It is a fitting tribute to a truly fantastic cat. Thank you. I accept PAYPAL, credit cards and ETSY gift cards. *I sincerely hope that the descriptions and pictures provided show a good example of what you will be receiving. In the case that you are dissatisfied with the product, I will accept returns within two weeks of receipt and upon receiving them back in my shop. I will refund you the cost of the item only. (Shipping will be the customer responsibility). In the event of a broken or damaged item in transit, I will replace it after I have received a photo for verification. All items will be shipped to the Paypal address supplied, unless other arrangements are made. Errors in shipping address will be the responsibility of the customer and if the item is returned to me, re-shipping will be the responsibility of the customer. I ship as promptly as possible. I always appreciate when items are shipped before their expected ship date and so I try to do that whenever possible - it's like a little extra gift after the purchase. I ship the stones USPS Priority Mail (1-3 day) because it has the flat rate option. The stones are very heavy and shipping even at a slower rate would be more expensive. I ship the magnets USPS First Class. Great. All items are nicely packaged and we are happy to include a card. Put details for the card massage in the notes at checkout. Also, double check you have the correct shipping address. No invoice will be included. All extra taxes, fees and duties are the responsibility of the buyer. After the order is shipped, Blessing and Light is not responsible for any further charges that occur. Please check with your local government for extra fees that may occur. * I enjoy doing custom work for people and I would be happy to help you create something for a special occasion. I reserve the right to photograph, post in my shop and sell any item that originated as a custom order. *All designs and work are property of Blessing and Light and protected from infringement of any kind. Please respect that hard work that goes into creating such items. How big/ heavy are the stones and can they really go outside? The rectangle stones are 6x9 and a full 2 inches thick and almost 10 pounds. The square ones are 6x6 (also 2 inches) and about 6 pounds. They are substantial in feel and can easily stand up. Yes, they are FULLY sealed (even the bookends) and all of the stones could be used indoors or out....promise. We also include free pads for the bottom to protect furniture if it would be kept indoors. I want to send this as a gift...what do I do? We are happy to send this directly as a gift from you and we can definitely include a card/message. ~Leave the message for the card in the "notes to seller". ~Make sure you have the correct name/address chosen for the shipping address. We wrap all of the stones beautifully and package them with care. Every order will include a care card and free pads for the bottom of the stone to protect the furniture if it would be kept indoors. We do not include any invoices and if you do not include a message/card they will not know who is sending it. How can I find out when you release new products? You can always check back here, but with almost 500 products they can easily get mixed in and missed. The best way is to sign up for my simple and sweet emails....nothing fancy and just what you sign up for:) I try to do a monthly roundup of new items I've posted. Memorial Stone. 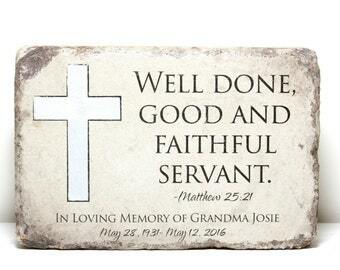 PERSONALIZED Memorial Gift. 6x9 Tumbled (Concrete) Paver. Remembrance Stone. In loving memory. Went to be with the angels. Memorial Stone. 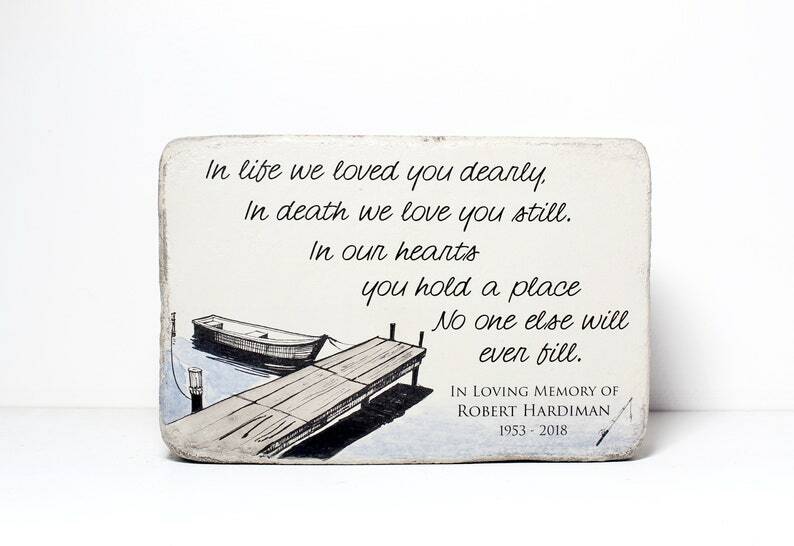 PERSONALIZED Sympathy Gift. 6x9 Tumbled (Concrete) Paver. Remembrance Stone. In loving memory. Went to be with the angels.